I discovered a new blog and challenge that I wanted to participate in. 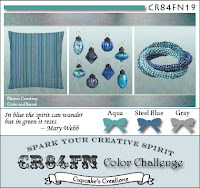 The blog is called CR84FN Color Challenge. These colors really got my creative juices flowing.This is my entry! As usual, my camera and camera skills, or both are not capturing the true colors in this card. It is very frustrating! Hope you like it! And check out this blog...great ideas!!! LOVE the papers and that GORGEOUS gray silk bow! Mackie this is just wonderful! THX for playing with us at CR84FN! Such a lovely card, Mackie! Your patterns are a perfect match with the inspiration colors and I love your beautiful satin bow! So glad you joined us at CR84FN.. hope you play again next week! What a pretty card Mackie!!! Love the distressing and the pretty patterned paper! Thanks so much for playing along with CR84FN! Great card! I love the way you folded the corner down to show off the other side of your DP, and that bow is luscious! Thanks for playing with CR84FN!